Ben Simmons and Brett Brown have given Sixers fans frustration lately. 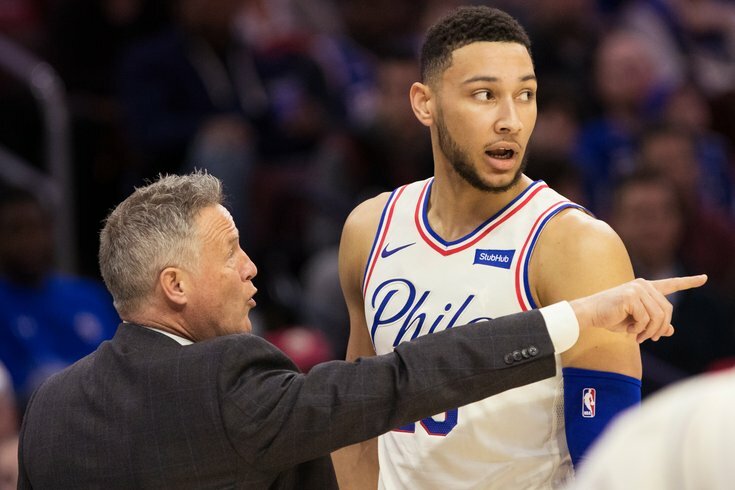 If the first game of the playoffs reflects the current state of the 76ers, Brett Brown will need to leave soon – and he can take Ben Simmons with him. The unfathomable loss on Saturday to a Brooklyn team that was fighting to make the playoffs a week ago became an indictment of Brown’s coaching and Simmons’ court leadership, made only worse by what was happening on the bench during the game and in the interview room after it. Does Brett Brown have any idea how to coach a good basketball team? Does Ben Simmons have any clue about this city? All you need to know about Brown’s performance on the bench in the opener at the Wells Fargo Center is that J.J. Redick – who fouled out with more than five minutes left – singled out Nets coach Kenny Atkinson’s game plan as a major reason for the loss. Unsaid was how inept Brown was in adjusting to the basic strategy of shutting down the outside game of Redick and Tobias Harris. At this point, expressing confidence in Brett Brown requires a total suspension of logic. In the first four years of his NBA head-coaching career, he proved exceptional only at losing. Last year, he got coached under the scorer’s table by Boston’s Brad Stevens in the second round of the playoffs. And now, it is Atkinson’s turn to expose Brown. He’s right. Let’s start with coaching. Why did he express immediate alarm last week when Brooklyn became the Sixer’s first-round opponent? Why wasn’t Brown more prepared for a Nets team he had already faced four times in the regular season? Why did he appear to make no adjustments during a 20-1 run by the Nets in the second quarter? Already, it appears the Sixers coach is feeling the pressure of Managing Partner Joshua Harris’ comment last month that it would be “very problematic” if the Sixers – rebuilt during the season with the addition of stars Harris and Jimmy Butler – didn’t go further than playoff finish last season. Harris doubled down on the pressure over the weekend when he refused to give Brown a vote of confidence. In the past few weeks, Brown has refused to address two issues – the remarks by Harris and the status of fragile franchise center Joel Embiid on the eve of the first game. Before that, before there was a mandate to win now, Brown handled every query with openness and honesty. At least he did offer a response when informed after the loss that Embiid and Amir Johnson were looking at Johnson’s cellphone on the bench while the game was under way – a major breach in discipline. “It’s completely unacceptable,” he snapped. Also unacceptable was the play of Simmons and his reaction to the inevitable boos that accompanied his nine-point (including one for five from the free-throw line) performance. For the past two years, Simmons’ status as a point guard – one of Brown’s boldest moves – has been debated for one obvious reason: He can’t shoot. After the game, Simmons took offense at the booing of a fan base that led the NBA in attendance this season. Does he think he’s still playing in Australia? Did he expect Philadelphia fans to endorse that pitiful showing? “If you’re going to boo, then stay on that side,” he said, referring to the Brooklyn supporters. “That’s how I feel. If you’re a Sixers fan and you’re going to boo, stay on that side.” He took a step back from the remarks the next day, too late to limit the damage. So let’s review. The Sixers lost the playoff opener to an inferior team. Brett Brown got out-coached again in the playoffs. Two players were caught checking a cellphone during the game. And, after a rotten performance, Ben Simmons ripped the fans who paid hundreds (thousands?) to witness that debacle. If Brown plans to coach in Philadelphia beyond this season – and if Simmons expects to stick around, too – what happened on Saturday cannot happen again. That’s not a threat. That’s the truth. As Tiger Woods accomplished the most astounding feat of his career at the Masters Tournament on Sunday, the world celebrated with unbridled joy his battle against adversity and his victory over time. Who couldn’t root for such a deserving hero? I was watching every minute of the riveting last three hours of Woods’ 15th major-tournament win – and fifth Masters – pleading with the golf gods to make him fail. It amazes me even now, a day later, that so many people wanted to see a man win who never gave a damn about them. When Woods tapped in the final putt to secure victory in Augusta, he waved his hat in a rare display of triumph, then marched one step ahead of his family for the phoniest of moments in a day filled with bogus emotion. Methodically hugging every member of his family, one by one, no one doing the broadcast on TV grasped the exquisite irony of the moment. I did. I saw the same man whose decline began during a less poignant family moment, the one where his ex-wife Elin Nordegren smashed a three-iron into the back of his SUV on Thanksgiving night 2009 as he tried to escape after she found out he had 19 – that’s right, 19 – girlfriends with whom he was canoodling behind her back. Was I supposed to ignore the way he turned his back on his family for all of those years? Was I supposed to feel good for his new girlfriend, who must already be wondering if his newfound success will lead to a return of his worst habits? Should I also forget about all of the fans he abused over the years, cursing at the click of a camera, pushing past the autograph-seekers as if they were invisible? Tiger Woods is a bad guy – always was, always will be. Yes, he may well be the greatest golfer in history, but only fans with the most selective of memories can embrace his brilliance on the course and ignore his boorishness off it. At 43, Woods accomplished something even more incredible that winning the Masters on Sunday. He found a way to make the world forget what a jerk he has been for all these years.